Yesterday 9th Wonder dropped a track with some heavyweights and delivered a one hit knockout. “Jedi Code” feat. 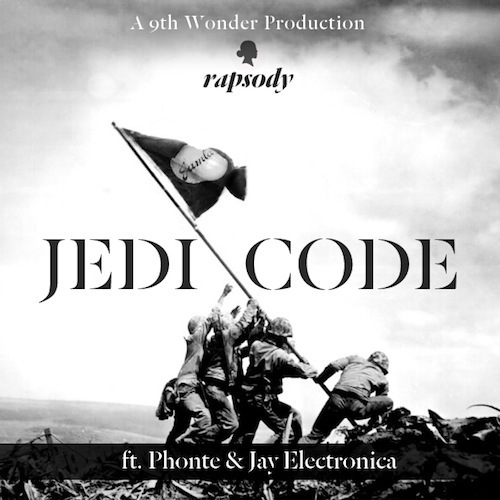 Rapsody, Phonte, and Jay Electronica are nothing less but perfection on this track. With 9th Wonder producing you can guarantee you’ll at least like one part of the joint as a whole. The super Mc’s joined forces to make a song that I considered to be over bearing (for my ears) and made me grin after every bar & stanza. The rhymes, flow, and lyrics are so profound that I honestly can’t pick my favorite verse. While I haven’t heard too much from Phonte, Rapsody just released her mixtape “She Got Game.” Even Jay Electronica has been on a couple tracks, does this mean he will finally be dropping his project? Haha hopefully, but as for this track it is a MUST listen download for a true hip-hop head.